This is my go to everyday lipstick in the fall and winter months. It’s a perfect mauvy pink that is office appropriate and perfectly completes a neutral makeup look. It’s a lustre finish so it isn’t drying on the lips and gives a subtle shine to the lips. When the weather starts getting a bit colder and the leaves change color, this is the first dark lipstick that I reach for. It’s a gorgeous cranberry shade that is just dark enough to really get you in the fall mood without going full vamp. It’s a really flattering shade and I’ve gotten a few compliments when I wear it. *cue the heavenly music* This lipstick is amazing! If you don’t already own this shade you need it in your collection. Not only is it a gorgeous color but it is one of the more versatile lipsticks I own. You can apply a single layer for a light berry pink shade or apply more layers to achieve a dark berry lip. I got this barely a few days into fall last year and it was the last one my MAC counter had in stock. Apparently I’m not the only one who thinks this is a must have for the fall. I’ve always loved dusty rose shades, particularly this time of year. Rose velvet is my top lipstick pick for a natural rose colored lip. It’s a great everyday lipstick that looks great with a natural makeup look or a more smokey eye. When I feel like going full vamp, I pull out this bad boy. It’s a similar shade to Rebel but not quite as versatile. I don’t pull this one out often but when I do I usually pair it with a black liquid liner and a bronze smokey eye. 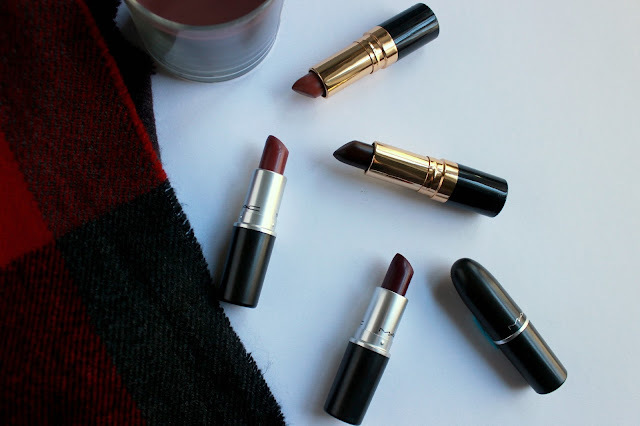 What are your favorite lipsticks for the fall? Thanks Leta! I actually just discovered them and I almost got Amsterdam but there were out of stock at my local Ulta. I'll see if I can hunt one down because it looks gorgeous! I'm glad I could give you some fall lipstick inspiration Kay! Great picks! You literally just picked my favorite shades for fall! LOVE all of them! Great minds think alike Esther! Good to know I'm not the only one loving a good berry lip this fall. These are beautiful pics! I usually still wear a few by Mac, basic/neutral colors because I feel like they look best on me. I used to be exclusively into Revlon lipsticks but I've grown my MAC collection over the last few years. Non ve ne pentirete . Rebel è incredibile! My favourite Autumn lip colours are MAC's 'Hang-Up' and Rimmel 107! If you haven't swatched them yet, definitely give them a try. I do need to get my hands on Rebel though, lovely post as always! Thanks Anjelique! I'll swatch them the next time I'm out!